From March 21-30, ten Hoban students traveled with Greg and I to Krakow, Poland, Prague, Czech Republic and Berlin, Germany (with a stop in Dresden along the way). We were in three countries with three languages and three currencies. It was a great adventure. And yes, we got lost a few times. The Travelers. Greg and I and our students begin a journey in Krakow. Around every corner Krakow has a hidden treasure. This was at one time a fish market. We explored each city on foot. Krakow's cobbles massaged our weary feet. Each building has a courtyard - a space full of light and fresh air. A place where men walk with pigeons. Friends? Or just strangers passing by? Love is blind. Siblings are goofballs. By the end of the trip and 8 days of bread and cheese, this graffiti proved prophetic. Our first full day in Krakow was spent facing the stark reality of the Auschwitz death camp and then going to the depths of the Wielizcka salt mine. Two extreme examples of the power of the human will. Work Makes Free - the gates that lead into Auschwitz Concentration Camp. This is the location where Hitler's "Final Solution" was put into action. Two fences, in the middle no-man's land. Our tour led us through the bunkhouses - each of these 10x20' rooms would have held 100+ Jewish prisoners as they slept, ate and awaited work each day. So many people have walked on these floors - as visitors, survivors and more than often, prisoners. The wallpaper in the building that had administrative offices looks like scarred skin - like varicose veins. In the basement was the punishment chamber. All possessions were confiscated from the Jewish prisoners and housed in buildings called "Canada" - named so because Canada was seen as a land of plenty. Each one of these brushes came from an individual person. There are 10,000s of thousands of them. 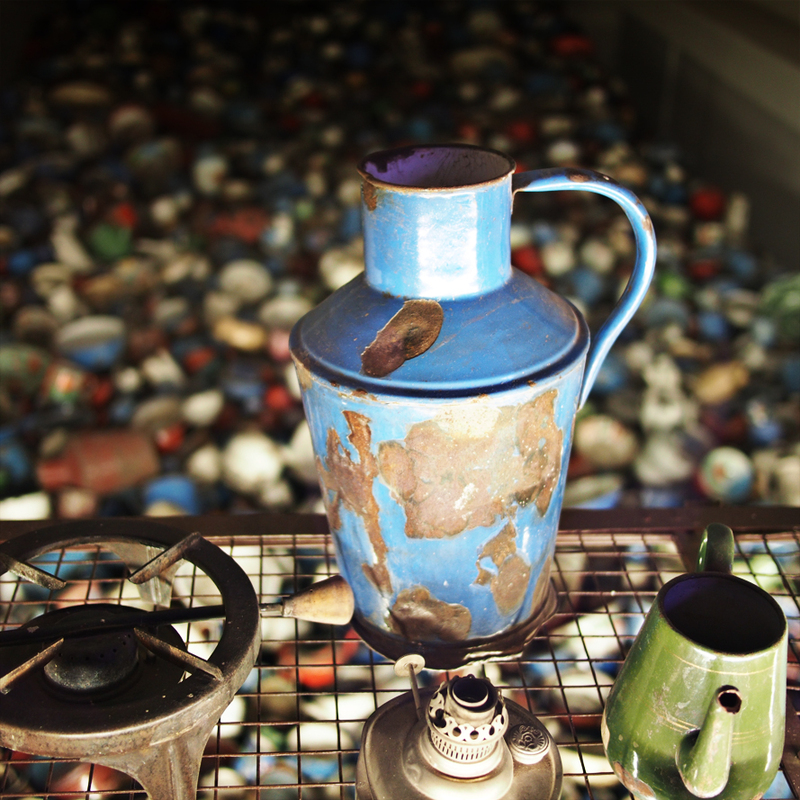 It's only a small sampling of what was confiscated while Auschwitz was in operation. "Canada." The sheer number of pieces of enamelware is staggering. Made me think of Schindler and his enamel factory that helped save many people. Every shoe belongs to a unique person. I'm sure they each could tell incredible stories. A group of 15 German political and military leaders developed the "Final Solution" at a meeting that lasted only 2 hours. 6 million Jewish lives paid the price. The goal was to remove the Jewish population first from Europe and eventually the rest of the world. Cyclon-B tablets were dropped through openings in the ceiling of the shower rooms after people had been ushered in. Standing in this space was haunting, terrifying, crushingly sad and infuriating. Moss grows between the layers of electric fence. The trees we walked by and touched were present when Jewish prisoners were in the camp. To see things that are a live and thriving is such a contrast to the atmosphere of this somber and horrible place. An urn that holds human ashes stands as a representation of the 4 million lives taken at Auschwitz and Birkenau. After spending several hours at Auschwitz and Birkenau, we traveled to the Wieliczka Salt Mine. This 13th century mine was a stark contrast to the horrors of the Holocaust. It was reassuring to see the good that humans can do when they combine energy, engineering, hard labor and artistry. The mine is over 300 meters deep and was in operation from the early 13th century through 2007. During that time miners would spend off-duty time sculpting statues and worship spaces out of the salt. Our group went 135 meters below ground and saw about 4% of the mine. We hustled down about 700 steps to reach the beginning of the tour. The mine is supported throughout with heavy wood beams. The beams become impregnated with salt and eventually petrify. These wood beams are coated in salt. The chandelier in this image is made of salt. Salt. Salt. Salt. Everything salt. Oh, and yes, you can lick the walls. This cathedral is all made of salt - the floor tiles, the railings and stairs, the chandeliers, the statues, the bas relief wall plaques. All of it. You can rent the space for weddings and events at the price of 40,000 zloty - that's about $1,000 per hour. That being said, I'm not sure how you'd get all of your guests down this far. It as about 120 meters below ground and remember, 700 stairs. Mr. Greg Milo ponders the salty greatness of Wieliczka. Today we began by meeting with artists and students at the Fine Art Academy located in Krakow. We saw their stone carving studios, figural sculptures and met with faculty to talk about their current artistic pursuits. A professor in the stone carving studio explains the learning process that students go through. Each student spends about 1 year to complete a full scale sculpture. Clay figural sculptures rest under plastic wrap until the students return to work on them. Wonderful light pours into student studios. After spending time at the academy, we relaxed in the Old Town Square by reading, writing, talking and drinking coffee. The Old Town Square is busy with shoppers, workers and people-watchers. A footbridge that crosses the Vistula River in Krakow is burdened with "love locks." Swans frolic on a sunny day. The civic tram system divides the sky into an azure mosaic. Though our time was short, we love you Krakow! After a night spent in the sleeper coffin, er, berth we arrived in Prague. It was a rainy morning and we got a little lost but eventually made it to our hotel and met up with friends Tasci, January and Max. We spent all day together, walking around the city and taking in endless architecture - Prague remained mostly undamaged during World War II. Pedestrians on Charle's Bridge are watched closely by statues of religious figures and royalty. Grog and hot wine. Oh, and Coca-Cola. We visited the Museum of Communism. It was kind of like walking into a grandparent's dusty attic. How many of my students had any idea of what this means? A communist-era classroom. Note "baby" in the background. Nobody puts baby in the corner. At the base of the Charle's bridge we were able to stand by the river's edge and hang out with a gaggle of swans. They were friendly though this one appears a bit incredulous. Charle's bridge seems to always be swarming with tourists. It's easy to understand why - there are statues lining the sides of the bridge and amazing skylines in all four directions. Saving this one in case I'm ever in a goth band and need an album cover. During our second day in Prague we walked up to the castle, posed at John Lennon's wall, ate Mexican food and gushed all over this beautiful city. Lots of rewards for looking up in the "Paris of the East." Easter weekend in the 2nd most atheist country in the world (N. Koreas ranks #1). After climbing our way up to the castle we were rewarded with a festive Easter market. A glass bodega serves as a storehouse for rotting things. The "crown C" is such a difficult sound to produce that many Czech youngsters have to consult a speech therapist. Our view from the castle stairs. Prague remained mostly undamaged during WWII because Hitler wanted to preserve the city for future use. Color tests on dusty architecture. After Easter Mass in Prague, we jumped on a bus and headed toward Berlin. Along the way we made a quick stop in Dresden to see the rebuilt city. Over 95% of Dresden was flattened by US firebombing during WWII. Our intrepid travelers take a moment for a group shot with Martin Luther in front of the rebuilt Frauenkirche. Note the dark stones in the church which are hallmarks of the firebombing during WWII. Bubble goofs in the Dresden square. The Dresden Cathedral, also called the Cathedral of the Holy Trinity stands on the banks of the Elbe River. The Fürstenzug (Procession of Princes). The reconstructed innards of the Frauenkirch. All of the columns and stonework are carefully recreated faux marble. The Elbe river & an old woman. Students walk toward the Franko-Prussian War Memorial in Berlin, Germany. The Bauhaus school - home of so many things I love about art & design. Treated to a sunset on the way back to our hotel in the Schoneburg neighborhood of Berlin (FYI Bowie lived in this neighborhood at one time). Our first full day in Berlin began with Wolfgang the tour guide flaking out on us. So, Greg and I plotted some spots on the map and led the group around town. Berlin is like a little big town - so accessible, so affordable and so friendly. Berlin Cathedral along the banks of the Spree river. A wall of the Reichstag inside of the Bundestag - covered with charcoal graffiti by Russian solders after the Battle of Berlin. Chancellor Merkel sits in a glass box of emotion. A massive mirrored chimney sits about the parliamentary meeting room. The mirrors change position to create ideal lighting and climate control. Rooms to let for Superman et al. Fernsteturm TV tower at Alexanderplatz. This communist-era construction rises 365 meters above ground. Just a week before we were in a mine that went about 325 meters underground. During our second full day in Berlin we spent time at Checkpoint Charlie Museum, in the Kreuzberg quarter and with our new friends at art & design studio 44 Flavours. Checkpoint Charlie - an entryway from West to East Berlin. The logo of the GDR - German Democratic Republic. When a car was laden with hidden people that were trying to escape into West Berlin, the driver would load the car's suspension with rubber balls so that it would not sag under the weight. This Union Carbide welder was used to smuggle dozens of people out of East Berlin. I won't lie, I have no idea what this was used for. I just love button and dials. This was a 2-story long tube full of soviet-era pins. Next to it was a column made of discarded diplomas. Cellist Rostropovich performed for hours at the base of the wall in 1989 when it began to fall. In Kreuzberg we walked through a beautifully unkempt cemetery. At the East Side Gallery we walked along 1.4km of the wall and viewed murals all along the way. The Kiss - Brehznev and Erich get to first base. Julio of 44 Flavours shares some of their great work. Julio and Sebastian - collaborators and instigators.